If only turning your staff around were as easy as turning the beat around. Well, maybe it is. If you’re looking for a team-building exercise that doesn’t involve trust falls or spirit sticks, Drum Café may be just what you need. “We use group drumming to support teamwork and communication in the corporate community,” says Aviva Nash, president of Drum Café New York. Drum Café is an international organization that travels to companies, bringing with it its high-energy brand of beats. While Drum Café’s New York branch is in its third year, the program started a decade ago in South Africa under the leadership of an entrepreneur named Warren Lieberman. Lieberman, quite the drumming fan, often had performers, including Nash, whom he knew from high school, at his impromptu sessions. “And it got so popular and exciting that all of a sudden, a couple of hundred people would arrive at his house to drum,” Nash says. Lieberman eventually moved the group from its informal meeting places to the national spotlight. As South Africa’s black community started integrating into the corporate world, the drumming program was an effective way to unite cultures. “Drum Café,” Nash says, “suddenly became synonymous with staff training, team building, development and recruitment.” The organization has spread so much since then that there are now locations worldwide, but the original, Nash says, still thrives in South Africa. So what compels a company to hire Drum Café? Nash says companies realize a creative program will inspire more creativity, which she illustrates through describing a typical session. When participants enter the room, Nash says, they’ll first hear and then look: First they’ll hear the professionals getting a rhythm going, and then they’ll see a drum on each seat. 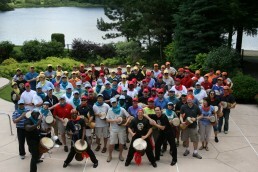 In order to sit, each participant must pick up his drum and play along. Nash says it takes about 30 seconds to bring everyone into a united beat. Earnestine Perry, a public relations manager with insurance provider Kaiser Permanente, says she brought Drum Café to her Atlanta location two years ago for the annual managers’ leadership conference. The performance is still fresh in her mind. “I thought it was really phenomenal,” says Perry, one of the employees charged with organizing the conference. She says she found Drum Café through the Internet, and liked that they worked with some nearby companies, such as Coca-Cola. Nash, who also serves as a facilitator, attributes Drum Café’s success to many elements. The first is the undeniable appeal of a drumbeat—one that closely mirrors one’s own heartbeat. She also says that the program emphasizes important concepts such as taking risks, boosting self-esteem and being innovative. Additionally, the unity in drumming breaks down barriers between participants. She also says that through drumming, participants relieve stress through rhythmic, left-hand, right-hand drumming.